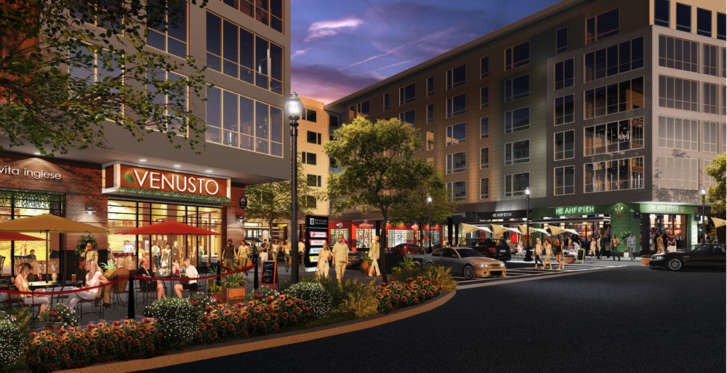 A mixed-use development in downtown Reston has announced its initial lineup of restaurants and retailers, and is now leasing luxury apartments. See photos. WASHINGTON — VY/Reston Heights, a mixed-use development in downtown Reston, Virginia has announced its initial lineup of restaurants and retailers, and is now leasing luxury apartments. VY, located at 11830 Sunrise Valley Drive, includes 385 apartments on five levels. Rental options include one-, two- and three-bedroom apartments and two-level loft units that rent from $1,800 to about $3,300 a month. Retailers that will open in 2018 include Super Chicken, Signature Thai, Allure Nails, Reston Kabob and WillPower Functional Fitness, a 35,000 square-foot gym with perennial trainers, CrossFit and wellness workshops. JBG Smith Properties is managing the property for owner RH Reston Parkway I, LLC. VY is a derivative of the word “very,” the developer said. The apartment community’s amenities include an open-air lounge with shuffleboard and billiard tables, a penthouse sky lounge with views of the Shenandoah mountains and Reston National Golf Course, a fitness center and pool, courtyard with fire pits, an on-site dog park and “pet spa” and a designated lawn for yoga and outdoor activities. “The property sets the bar for luxury living in Reston with a high level of amenities, retail and access to the outdoors and activities for the consumer who values both a quiet evening in a comfortable home overlooking nature, and entertainment or activity right outside of their front door,” said JBG Smith Executive Vice President Greg Trimmer. The property has access to hiking and biking trails on Lake Thoreau and the W&OD Trail.